Anaerobic digestion is the most widely process used for the stabilisation of wastewater treatment sludge. Organic matter is transformed into CH4 and CO2 by the action of different bacteria groups. The main advantages are the reduction of the volume of waste sludge and the production of methane gas that can be utilized as energy supply for the process. During anaerobic digestion of activated sludge from enhanced biological phosphorus removal process (EBPR-process), most of the phosphorus eliminated during the water treatment, as well as that from cellular lysis, is released. So that, phosphorus concentration in the digester increases and precipitation problems can occur. In this work, anaerobic digestion process of waste activated sludge and primary pre-fermented sludge was studied in a pilot plant. 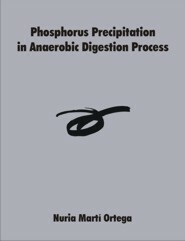 Furthermore, phosphorus balance was performed in order to quantify phosphorus precipitation in the digester. Separate and mixed thickening of sludges was carried out with the aim of study its influence in the process. NOTE: This thesis is in Spanish.